My first apartment was a second-story condo in an urban complex, far displaced from the groomed suburban landscapes and sprawling gardens I had grown up with. My only connection to the outdoors was a small porch, surrounded by brown siding and a fading carpet of artificial turf. To add a little color to the patio, I adopted a few small tomato plants from a friend who had started his garden indoors, and planted them in large pots near my railing. To my surprise, they started to grow. Soon I had filled the 5′ x 10′ space with more than a dozen ceramic pots, plastic containers, and beach pails filled with peppers, tomatoes, cucumbers, lettuce and pole beans. Before I knew it, my porch was a curtain of green and my meals regularly featured home-grown vegetables. Well-planned patio gardens allow gardeners to make the most of a small space while maintaining a degree of control not available to those who plant in the ground. If a plant is not getting enough sun, it can be moved. If it is not draining properly, more holes can be added. Healthy plants prevent pests, and some, such as slugs, are not even a factor. Watering is more efficient, because it must be done by hand, making a patio garden ideal in a drought situation. And at the end of the year, even inexperienced gardeners can enjoy a bounty of vegetables thanks to the built-in advantages of garden containers, which include regular drainage and nutrient-rich soil. Herbs also make great container plants, as they survive in generally drier conditions. Pots offer the opportunity of bringing herbs inside when the weather gets colder. 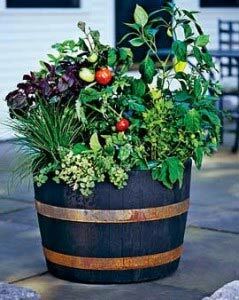 However, many herbs are fast-growing, so it’s best replant the container each spring. 2. The size of a plant can vary depending on the variety of seedling used. Make sure containers are large enough to accommodate a full-sized plant. Most tomatoes will need at least an 18″ square container. Peppers, however, are perfectly happy in smaller pots. 3. Cover the holes at the bottom of the container with small rocks to improve the soil drainage. 4. Part-fill the container with compost. A slow-release fertilizer can be added at this stage to distribute nutrients as the compost dries out. Fill the remaining space with a nutrient-rich planting soil. 5. Water the plants and let them drain. Take them out of their pots and arrange in the container, packing in tightly. Fill in any gaps and firm all the plants in place. Keep the soil below the rim of the pot for easier watering. 6. Water the container well and move it to its final position. Arrange plants according to their needs. Tomatoes prefer a south-facing porch with full sun, while spinach and lettuce are happier near the house in partial shade. Make sure the place where you want to plant gets at least six hours of direct sun every day. 7. Trellises, cages or poles will be needed for tomatoes, cucumbers, beans and other vines. Patio gardeners can also take advantage of permanent features, such as fences and railings, to support their plants. 8. Containers need to be watered at least once a day in summer. They also require regular fertilization. A fertilizer dilutor can be clipped on to the hose to feed plants as you water. With just a little time and imagination, any drab patio can become home to lush green vines, red peppers, juicy tomatoes, and succulent cucumbers. Why not start today?